You've found the perfect home for your family vacation! We have plenty of room for multiple families to enjoy time together. The house includes five bedrooms, three and a half baths, fully equipped kitchen, screened in porch and deck overlooking a relaxing pond with fountain. Every room has a flat-screen TV with DVD player – enjoy a movie on the large 50” widescreen TV in the loft. We also have a game room in the garage which includes foos ball, ping-pong, shuffleboard and hot shot basketball! This two-level home is perfect for two or three families to enjoy. The downstairs has a master suite with a king bed. Also on the lower level are a bedroom with a queen bed and a bedroom with two twin beds. The upstairs level has a large bedroom with a king bed and a second bedroom that can sleep four in the pyramid bunk. For your convenience, we’ve provided a pack-n-play for your infant or toddler. The home is located in the Bayside Resort conveniently located at Routes 54 and 20. 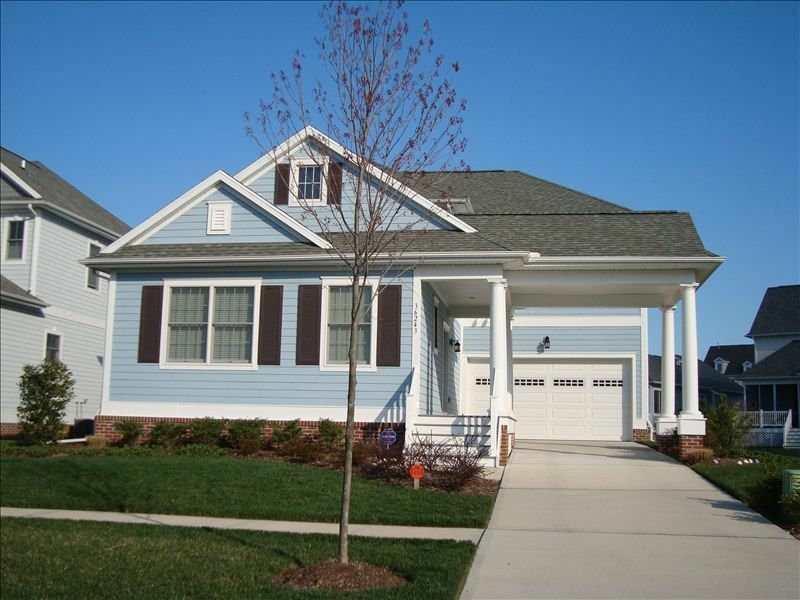 We are a short 4 miles from Fenwick Island beach and the beaches of north Ocean City. You can choose to drive to the beach or take the community shuttle service (between Memorial Day and Labor Day). Nearby beaches also include Bethany, Ocean City and Rehoboth. There is so much to do in the beach towns, including boardwalks in Bethany and Ocean City, mini golf, amusement parks, water parks, restaurants, and tax free outlet shopping. Also within the community is a Harris Teeter grocery store open 24/7. You can also choose to stay in the community to enjoy all the amenities. The golf enthusiast will enjoy the 18-hole, par 72 championship golf course. Designed by one of golf’s greatest champions, Bayside’s Jack Nicklaus Signature Golf Course surrounds the community. The community also has two outdoor pools, an indoor pool, splash park, hot tub, tennis, volleyball, fitness rooms, kayaking, paddle boarding, fishing dock and more! We hope you come to Bayside where you can have fun, relax, hit the ball straight and enjoy the sunshine! The property was perfect for our family gathering (eight people). There was plenty of space for spending time together as well as privacy. The game room and community amenities were a big hit with everyone. Excellent communication from owner before, during and after the trip. 6 adults and 2 small kids had a very nice team during our stay in August. The house is in a very nice and clean development, minimal traffic and a nice supermarket within a 5 minute drive. The 2 pool facilities were a hit with everyone too (1 facility has 2 pools and a large splashpad and the other has 1 large and 1 kiddie pool). If it wasn't 95 degrees, the screened in porch would've been lovely, and our kids did enjoy it when it wasn't too hot. Keycode access made getting in the house easy for our 3 separate parties too. The bed and bathrooms were all very nice, kitchen was somewhat equipped depending on how much you plan to cook (I successfully made fried chicken and a cookie cake and I didn't need my tools for this). The living room areas on the top and bottom floor were really nice, however it was impossible for us to have both tvs on at the same time due to the way the sound traveled (not a huge deal). We all liked that Netflix and Youtube were hooked up through cable, and we could link our account to watch what we wanted. If I could make one complaint, it would be with the garage. The pingpong table, basketball game, foosball and shuffleboard table were nice, however there was shuffleboard powder on the floor by the steps leading into the garage making it unsafe to play (I actually slipped and fell at one point near the stairs). This may be due to the heat, but we noticed an unpleasant smell as well, maybe mildew? With the heat opening the garage door for ventilation didn't do much. One other minor complaint was that the bathrooms could use bathmats. We were fine bringing our towels and linens, but just for safety purposes bathmats would've been nice. Certainly not a deal breaker with the cost of the house for the week, but I wouldn't expect people to bring their own mats, and the floors are tile and can be slippery when getting out of the shower. All in all we would return to this house again if we came back to the area. The amenities in the community (and community itself), close by beaches, and cost of the house made it well worth it. House is perfect for a family. Clean, spacious and fun. Owners are great. Had a minor issue with a cable box and they fixed it right away. Top notch. Really enjoyed our stay at this house, we had 10 of us and there was plenty of room for all of us to enjoy. We also enjoyed the bayside pool and were close to everything including Ocean City, Rehoboth and Fenwick State Park. House was very nice and had all the conveniences needed. Centrally located to all community amentities. Thank you so much for renting us your home. It was very comfortable and we had no issues at all. Everything was great. The weather was good all week and we had a wonderful time with all the amenities at Bayside. Definitely recommend to anyone considering a stay there. Our home is located in the Bayside Development on Route 54. The development is a short drive to Fenwick Island beach, Ocean City, and other Delaware beaches. The development includes a Jack Nicklaus 18-hole golf course, pools (both indoor and outdoor), splash park, hot tub, tennis courts, basketball courts, fitness room, kayaking, paddle boarding and fishing dock. There are additional fees to access the community amenities. The award winning Freeman Stage is also located in the development offering various musical acts from Memorial Day through Labor Day. Additional fees are charged by the Bayside Recreation Ctr. to use amenities such as the pool, kayaking, paddle boarding, tennis, fitness room, etc. For mid May through mid September 2017, the fee is $49.00 per person per week for each guest age 5 or older. Renters can opt to purchase a consecutive three-day pass for $38.00. Payment is made directly to owner, who can provide addl. information.